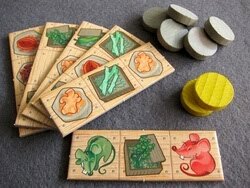 Rat Hot is the Queen small-box release of Michael Schacht's Dschunke: Das Legenspiel, an abstract tile game that was developed from the goods-tile-laying element of Dschunke. In the game, players stack 3 by 1 tiles with crates on them to create large connected areas of goods in their own colour while trying to avoid (or cover up) rats. To start, it's worth noting that there are two different games here. The original DDL was released free to print-and-play from Michael Schacht's website and some of the rules (and tiles) were changed for the Queen release of Rat Hot. There's some argument about which is the better game, with agreement that Rat Hot is lighter. I'll look at the differences a little later. The components of the Queen version are typically nice, with solid cardboard tiles containing spices, empty crates and rats. Rat Hot also uses continuous scoring throughout the game rather than DDL's end-game scoring, so it includes wooden scoring markers worth 1 and 2 points to keep track as the game goes on. DDL used a variety of different goods, but they were equivalent to Rat Hot's spices. The goal of both games is to create groups of two or more of the same coloured spices. 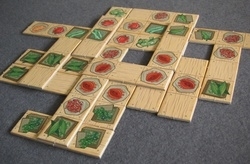 Each player takes either red or green and scores groups of the same spices in their own colour. Most pieces contain items of both colours, so it's often as important to not leave your opponent with nice grouping opportunities as it is to create them for yourself. Tiles can be laid anywhere with the exception that they can't be laid exactly over another tile, must be laid level, and all of the three spaces of the tile must be supported by the table, or tiles underneath. In Rat Hot, groups are checked after each tile lay to see whether any groups have been created or changed by the laid tile. Only groups with at least one symbol on the new tile count for scoring. For each groups of 2 symbols, the player of that colour receives 1 point, for groups of 3 or more, the player receives 2 points. The game of Rat Hot ends normally when all the tiles have been laid, and all visible groups are again scored with the same points for 2 or 3+ symbol groups. It is also possible for the game to end suddenly if there are three rats of a player's colour visible at the end of their turn. In this case, the player with 3 rats immediately loses without scores being added up. This sudden-death ending means that a player who leaves several rats uncovered is running a risk that their opponent will be able be able to place a 3rd rat that can't be covered. Of course, it's possible that you may draw a rat tile on your own turn, leaving you with few options. In the picture below, green has incautiously allowed 2 green rats to pile up in a spot that's going to be difficult to play over. DDL, lacks both the sudden death rat loss and the continual scoring. The only differences between the DDL and RH tiles are that some double red and double green rat tiles have been transformed into a one-green one-red tile to avoid sudden-death endings. The scoring in DDL is done only at the very end of the game and much bigger groups are rewarded, with group of 2 being worth 3 points, up to 55 points for 10 symbols in a single group. Visible rats simple count as -1 points for the player of their colour. This end game scoring means that DDL is a far less tactical game and players don't spend their time frantically thrashing to complete as many little groups of 2 or 3 symbols as possible each turn. Instead, players work against each other to block the creation of large groups while trying to create their own groups with highly stacked pieces that can't easy be overlaid, often the game does end up stacked higher. While Rat Hot is fluffy light fun, I much prefer the longer and more thoughtful game of Dschunke: Das Legenspiele, it's simply more rewarding to play through the whole game with an eye on the end-game scoring and then to see how well you've managed when the scores are calculated. I'm of the opinion that the small change in rat distribution doesn't make any meaningful difference to the game, so you should feel free to grab a cheap copy of Rat Hot and get the DDL rules directly from BGG or Michael Schacht's website.